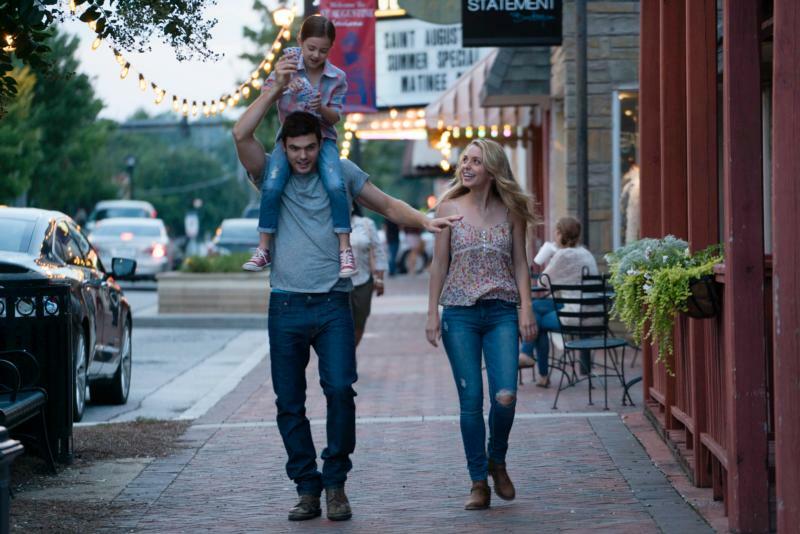 NEW YORK (CNS) — Most of the characters in “Forever My Girl” (Roadside Attractions), a gentle adaptation of Heidi McLaughlin’s romance novel about an aspiring country music star, have a song on their lips. This is the warning to Liam (Alex Roe), the son of a minister, Pastor Brian (John Benjamin Hickey), who returns to his small Louisiana hometown after his best friend from high school dies in a car accident. He’s been single-mindedly selfish in pursuit of his singing career, but giving himself over to reflection and reconnecting with small-town mores, he decides to reconnect with his former high school girlfriend, Josie (Jessica Rothe). Therein turns the only twist in the plot. Jessica has a precocious 7-year-old daughter, Billy (Abby Ryder Fortson), whom Liam instantly recognizes as his own. She was born months after what was supposed to be his and Josie’s wedding day. This revelation sends Liam straight into a Sunday service at which his father preaches about forgiveness. Liam’s never overly anxious, though. He’s usually nearly somnolent — a common flaw in low-budget films of this type in which the actors are compelled to be “likable” and without a dark side. Usually, the only suspense in this type of story is how long it takes for the lead character to find redemption. Liam, though, turns up halfway there and without resistance. Real life and small towns work nothing like this idealized plot. But writer-director Bethany Ashton Wolf plays up the romantic and faith-based elements to smooth over stilted performances and dialogue. Lectures about adulthood are as abundant as the pitchers of sweet tea and pots of gumbo. Anger, frustration and seething behind amicable exteriors would not be out of place here, but these characters are all so stoic, they refuse to indulge in that. Then again, adult responsibilities are quite beneficial to Liam’s songwriting. The film contains adult themes of life and death and references to excessive alcohol use. The Catholic News Service classification is A-II – adults and adolescents. The Motion Picture Association of America rating is PG — parental guidance suggested. Some material may not be suitable for children.